Yogyakarta is endless when talking about "instagramable" destinations. This time, there is an ice cream cafe that will spoil the young people who like to take pictures. One of the newest "instagramable" cafe destination is Ice Cream World that located at Jalan Solo Km 11 No 31, Sukoharjo Village. This cafe is more prioritized for photo studio. This place has been first opened on February, 13rd 2018. Actually, this place is the same of ice cream cafe in Bali because the cafe is a branch of an ice cream cafe of the same name in Bali. Ice Cream World is not only serving ice cream and gelato, but also having some special room for take pictures. The rooms are made like a small photo studio. Inside there are many displays and ornaments shaped ice cream, with shades of color. This place is open from 10/00 a.m to 07.00 pm. The entrance fee is 80,000 Rupiah/person for adults and 40,000 Rupiah/person for children. 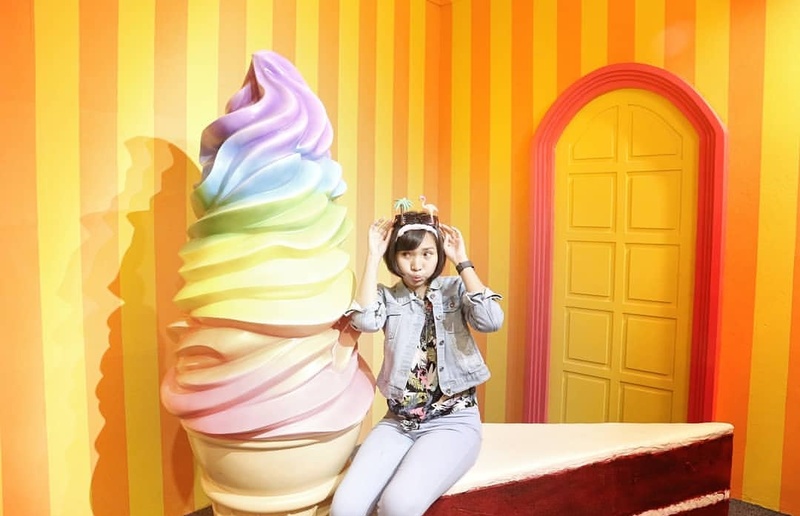 Besides able to take pictures as much, visitors can also get free ice cream. Ice Cream World that has been opened for a month is always filled with visitors, especially on weekends. Average visitor of Ice Cream world are young people and family.